Ozone is a fairly simple molecule, with only three atoms. However, in order to focus on one aspect of ozone's structure, we will use a hybrid approximation in order to simplify the picture. The Lewis structure of ozone is somewhat unsatisfactory. That's because the true structure of ozone can't be drawn easily using Lewis conventions. Ozone is an angular structure in which both oxygen-oxygen bonds are about 1.278 Angstroms long. However, the Lewis structure of ozone does not reflect that reality. In the Lewis structure, one pair of oxygens is double-bonded and the other is single-bonded. If this were true, there would be two different bond lengths in ozone. One bond would be about 1.49 Angstroms long, like the O-O bond in peroxide. The other bond would be about 1.208 Angstroms long, like the O=O bond in dioxygen. The bond in ozone looks pretty close to a double bond, doesn't it? It is just a little longer, however. In Lewis structures, we fix this discrepancy by drawing two resonance structures for ozone. In one structure, the double bond is between one pair of oxygens. In the other structure, the double bond is between the other pair. The resonance structures imply that the real structure is somewhere in between the two that are shown. Roughly speaking, there should be one-and-a-half bonds between the neighbouring oxygens. Nevertheless, Lewis structures have trouble illustrating the nature of the double bond in ozone, which seems to be both there and not there at the same time. Allyl cation, CH2=CHCH2+, is another conjugated system. Use resonance structures to show how its double bond is delocalized. Use resonance structures to show that the negative charge in a formate ion (HCO2-, C is in the middle and attached to the three other atoms) is spread out (delocalized) over more than one oxygen atom. We could get another look at bonding in ozone using a molecular orbital approach. We are basically concerned with one question: what is the nature of the double bond? We already know about double bonds. We have seen them in compounds like nitrogen. A second bond is generally made through a pi bonding interaction. Therefore, we are only going to worry about the orbitals that will form pi bonds. Ozone is made of three atoms at an angle to each other. They are, by definition, a plane. A planar system can be described in a simple hybridization model using the s orbital and two of the p orbitals on each oxygen. We will assume some combination of these orbitals interact within the plane to form the first bonds between the oxygens. We won't worry about the details. Each oxygen on ozone has a p orbital that was left out of this sp2 set. These leftover p orbitals could interact with each other to form a pi bond. We have three orbitals to combine. Therefore, there will be three combinations. In one combination, all three orbitals are in phase. This combination will have a node through the plane of the molecule (because they are p orbitals) but none cutting through the molecule crosswise. This is a low energy, highly bonding combination. In another combination, all three orbitals are out of phase. This phase will have a node through the plane of the molecule (because they are p orbitals) and two more nodes cutting through the molecule crosswise. This is a high energy, highly antibonding combination. In a third combination, the middle p orbital can be thought of as out of phase with one neighbour but in phase with the other. This phase will have a node through the plane of the molecule (because they are p orbitals) and one more nodes cutting through the molecule crosswise. Because the bonding and antibonding interactions within this orbital cancel out, this is nonbonding combination. More correctly, this combination is usually drawn as a p orbital on each end of the molecule, out of phase with each other. The middle p orbital might as well sit out because overall it isn't doing anything. This depiction stil has one node cutting through the molecule crosswise, and is energetically equivalent to the other way we drew it. However, the first way we drew it is disqualified by symmetry rules (it is too lopsided). Populating these orbitals, and getting an exact energy, is not possible given the huge approximations we have made. However, in focusing on the pi bonding, we see something that we can't see in Lewis terms. There really is a pi bond that stretches the entire length of the ozone molecule. This is the lowest energy combination, with a wavelength steretching over twice the length of the molecule. Pi bonding in ozone is delocalized over all three oxygens. Because it is low in energy, the extended pi bond is pretty certain to be populated by electrons, and it will make some contribution to the structure of ozone. How much impact it has would depend on the population of the other combinations, which we can't predict without a more careful approach. There is delocalization in the following species. add any missing lone pairs. show delocalization using resonance structures. 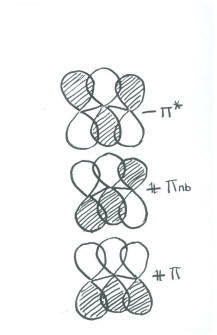 show delocalization using drawings of the orbitals used in pi bonding. Construct a Huckel MO diagram for each of the cases in Problem MO14.3. In each of the following cases, there may or may not be conjugation involving lone pairs and pi bonds. Show why or why not, using drawings of the orbitals involved.